Gospel Music Hall of Fame member George Beverly Shea has died at the age of 104. A bass-baritone with chesty resonance and impeccable diction, Shea recorded more than 70 albums during his career. His 1966 LP Southland Favorites, recorded with the Anita Kerr Singers in Nashville, won a Grammy Award. In 2011, Shea was given a Lifetime Achievement Award by the Recording Academy. Born Feb. 1, 1909 as the son of a Methodist minister, Shea was a native of Ontario, Canada. As a young man, he worked for Mutual Life Insurance in New York City. His singing career began with radio stints in Manhattan and Philadelphia. In 1939, he became a staff announcer and singer in Chicago on WMBI, a station owned by the Moody Bible Institute. He met Billy Graham there in 1943. Graham recruited Shea to perform on his radio show, “Songs in the Night” (1944-52). Shea was also the host of the ABC network religious show “Club Time” (1944-52). Later, he and Graham starred on the long-running weekly broadcasts “Hour of Decision” (1950-present). He was featured at the first Billy Graham Crusade, staged in Charlotte, N.C. in 1947. In fact, Shea was initially billed above Graham, since he was the better-known of the two at the time. He also began his recording career in 1947. 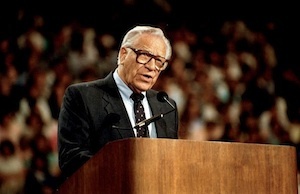 George Beverly Shea was the author of several books, including Then Sings My Soul (1968), Songs That Lift the Heart (1972) and his 2004 memoir How Sweet the Sound. He is also the subject of the 2009 authorized biography George Beverly Shea: Tell Me the Story. He was inducted into the Gospel Music Hall of Fame in 1978. Shea is survived by wife Karlene, plus children Ronald and Elaine and several other descendents.